New study reveals the complex strategies crab spiders use to soar on streamers of silk. 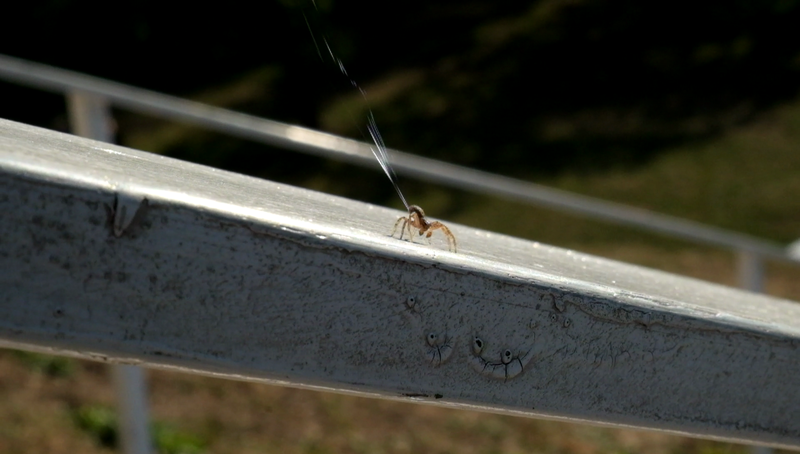 A crab spider spins silk lines into the breeze in preparation for a ballooning flight. This photo can only be used if published with this Inside Science story. (Inside Science) -- Imagine you’re a spider marooned on a post in the middle of a large lake. A human might fret over escaping such a trap, but as a spider, you know just what to do. You raise your rear end to the breeze, shoot out a spray of gossamer threads, and wait until a rising air current carries you up, up and away. Remarkably, the threads don’t have to cup the air like a balloon or a wing. Many kinds of spiders can fly using just the lift created by ultrathin streamers of silk. Now, a new study with crab spiders is helping to reveal just how they do it -- and why spiders only fly in slow winds. The study, which is currently under review for publication in an academic journal, is posted on the preprint server bioRxiv. Credit: Moonsung Cho et al., Technical University of Berlin, bioRxiv 206334. Spider flight, known as "ballooning", usually goes unnoticed by humans. Most ballooning spiders are smaller than a sesame seed, and their silk threads are often thinner than the wavelength of a visible light wave, making them nearly invisible, said the study's first author Moonsung Cho, an aerodynamics engineer and graduate student at the Technical University of Berlin in Germany. "Oftentimes you don't see the spider itself," said Angela Chuang, a graduate student in ecology at the University of Tennessee in Knoxville, who was not involved in the study. "You see this kind of glimmer of sun reflecting off of the silk line." But once you know what to look for, you can find flying spiders everywhere, said Chuang. She even saw some while reading Cho’s paper in a park; several little jumping spiders approached as though curious, then spun silk lines and drifted away. For web-weaving species, ballooning is often how babies disperse from their mother’s web, as immortalized in the novel Charlotte’s Web. Adult or subadult spiders may balloon in search of mates, food or a place to breed, or to escape someplace inhospitable, said Chuang. Ballooning can take spiders on remarkable journeys, up to 3 miles in altitude and hundreds of miles in distance. In fact, spiders are often among the first species to colonize new volcanic islands or areas ravaged by natural disasters, said Chuang. Most research on spider ballooning has focused on small spiders, and indeed, the majority of ballooning spiders weigh less than 2 milligrams. But scientists have observed the behavior in spiders up to one-half inch long and weighing as much as 150 milligrams, about the weight of a sunflower seed in the shell. Cho and his colleagues wanted to understand how larger spiders fly -- information that could someday lead to robots and instruments that use the same technique. But before they could work out the math, they needed to know more about the spiders' takeoff procedures. Cho focused on crab spiders from the genus Xysticus, which weigh about 6 milligrams to 25 milligrams -- relatively large for spiders that balloon. In one set of experiments, he collected wild crab spiders and placed them on small mushroom-shaped domes in a field, then observed how and when they ballooned in natural air currents. Next, he placed spiders on flat platforms in the lab, where he could control the flow of air. A wind tunnel created a gentle horizontal breeze, while a hair dryer blew upward in front of the wind tunnel to create warm updrafts. In heavy breezes, spiders dropped down below the rim of the dome or platform on a single support line, then spun ballooning lines behind them. In lighter breezes, they used the classic "tiptoe" pose -- climbing to the highest point, turning to face the wind, and raising their abdomens as high as possible. But before assuming tiptoe pose, the spiders did something unexpected: They lifted one or both front legs and waved them in the air, apparently sensing the breeze. The experiments also exposed differences between the crab spiders' strategy and that of their smaller cousins. In the past, researchers have observed very small spiders dropping down on a single "drag line," a type of silk spun from the front pair of spinnerets, then waiting for a breeze to tear the dragline loose. But instead of flying on their drag lines, the crab spiders used them as safety anchors, sticking a pair of them to the dome. Then, they would spin 50 to 60 flight lines made of the same kind of silk they used to wrap prey, spraying them from their rear spinnerets. Remarkably, the lines didn't tangle, but instead fanned out into a flat, undulating triangle. Sometimes the spiders would cut their dragline anchor soon after liftoff. But other times, they would extend the dragline for several meters, flying like a kite before eventually cutting themselves free, said Cho. Several researchers have tried to eyeball the length and number of spider ballooning silks used in a single flight, but Cho's team may be the first to take precise measurements. Cho measured the length of ballooning lines by wrapping them around an 8-inch-wide wire frame, and he caught sections of silk on microscope slides for detailed examination. Most of the ballooning silks turned out to be about 2 yards to 4 yards long and less than one ten-thousandth of an inch thick. "The methods that they had to use in order to collect this data are just not easily done," said Chuang. In a final set of experiments, Cho and his colleagues analyzed wind currents on a grassy field. Cho believes that spiders may use updrafts caused by turbulence to lift them into the air. His measurements showed that within a few meters of the ground, such updrafts are more common when wind speeds are relatively low, during the slow phase of their natural fluctuations. This could explain why spiders rarely balloon in winds faster than about 7 mph. "Spiders tend to become airborne when it is warm and there’s a light breeze," said Andy Reynolds, a mathematical biologist at Rothamsted Research in Harpenden, England, who has created mathematical models of spider flight but was not involved in the new study. "What these new experiments show is that the spiders use the movement of the air itself to assist in this launch." Together, the findings help confirm that one secret of spider flight lies in the tiny diameter of their silk threads. Large objects have lots of inertia when they plow through the air, but on the nanometer scale, inertia barely matters. Instead, small objects are governed by the sticky force known as drag. "From the viewpoint of spider silk, air is like honey," said Cho. Because of this stickiness, even a light updraft is enough to tug the silk skyward, counteracting the weight and inertia of the spider. These ideas were previously modeled by a team including Longhua Zhao, an applied mathematician at Case Western Reserve University in Cleveland, and Laura Miller, a mathematical biologist at the University of North Carolina in Chapel Hill, as well as Chuang. "Our model was complete speculation, so it’s good to ground that in reality," said Miller. Zhao and Miller plan to incorporate Cho's findings into their future work. Unlike the powered flight of airplanes and birds, spider flight requires little or no energy beyond what is provided by the wind itself. If engineers could take advantage of such passive mechanisms, they could potentially make small flying robots that are highly energy-efficient, said Miller. But for Cho, the research has value beyond its practical applications. It has opened his eyes to a new kind of natural wonder. "Before I started this research, I didn't know that spiders fly," said Cho. "But actually, there is this kind of phenomenon, which I think is something amazing -- something mysterious, something magical." Nala Rogers is a staff writer and editor at Inside Science, where she covers the Earth and Creature beats. She has a bachelor’s degree in biology from the University of Utah and a graduate certificate in science communication from U.C. Santa Cruz. Before joining Inside Science, she wrote for diverse outlets including Science, Nature, the San Jose Mercury News, and Scientific American. In her spare time she likes to explore wilderness.